A nesting box made out of the cover for a hybrid car battery. Anyone who drives a Chevrolet Volt, which is powered by electricity and gasoline, probably feels good about the fact that hybrid cars are environmentally-friendly. Now, they can feel even better because bats and other creatures are benefitting from the car’s battery covers, Business Insider reports. The automaker turns the cases in which the car batteries are shipped into nesting boxes for bats, owls, wood ducks, and eastern bluebirds because they can’t be recycled. John Bradburn, the waste reduction expert for Chevy’s parent company General Motors, said he and his team have installed hundreds of the nesting boxes at the wildlife habitats GM maintains near its facilities throughout the world. 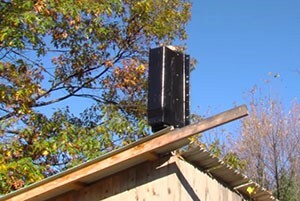 Up to 15o little brown bats can fit in one nesting box, the report said. Check out the video below to see how the nesting boxes are made, then check out our 10 helpful bat management tips.